By the end of September, the first science grade K2 observations from Campaign 0 should be made available to the astronomical community and the public. Stayed tuned to this space for updates on the data release and how we’re making Planet Hunters ready to accommodate the K2 observations. While we eagerly await the public release of the first full science grade data from K2, I’ve been thinking about how K2 serves as a stepping stone to TESS, which is expected to launch in 3 years from now. Over its 2 year mission, TESS is going to monitor ~200,000 of the brightest stars across the sky for the signs of exoplanet transits by taking measurements of the stars’ brightness every 2 minutes. Most of these stars will be observed for only 27 days in total (though some patches of sky will be observed longer – see the expected sky coverage plot below) , but the worlds discovered around these bright stars, unlike most of the Kepler planet candidates and confirmed planets, will be able to be followed-up using ground-based techniques and technology as well as from the space-based James Webb Space Telescope (JWST). This will enable astronomers to probe the composition and structure of these planets’ atmospheres as well as their bulk composition. One thing that I hadn’t appreciated from TESS was the engineering images it will take in addition to the 2 minute light curves. 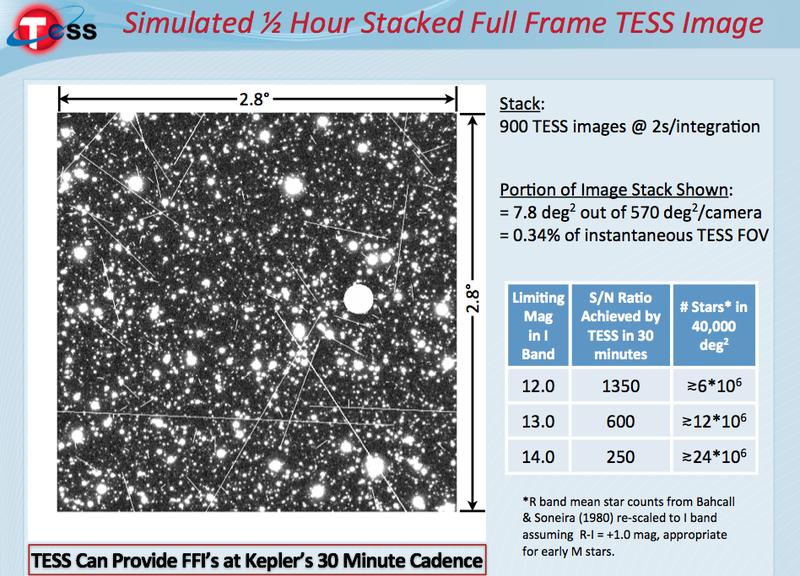 TESS will target a small number of bright stars at a 2 minute cadence, but every 30 minutes TESS will take the equivalent of a full frame engineering image across its roughly 2000 square degree field-of-view. These means we basically get the equivalent of Kepler observations but with blurrier vision (Kepler had pixels that covered 4 arcseconds per pixel. TESS’s are much larger covering 21 arcseconds) and 20x more area. Below is a simulation generated of what a subsection of one of these engineering images might look like from a presentation by TESS principal investigator George Ricker at NASA’s Exoplanet Exploration Program Analysis Group (ExoPAG) meeting back in January. We know from Kepler that it is possible to detect a plethora of exoplanet transits with 30 minute observations, so there is an exciting prospect of mining the engineering images. With the science that has already been done with Kepler both in the field of exoplanets and other astrophysics, the TESS engineering images will no doubt be a treasure trove of data waiting to be tapped into.Before Kepler the only star that had been monitored to such precision and cadence was the Sun. Kepler has changed that, but TESS will take it to the next level. With the Kepler-like quality of the engineering data, it means that if you don’t like the stars the TESS team decided to target, anyone can do an exoplanet search on other stars in the TESS field among other searches and studies like looking for supernovae or cataclysmic variables. There is a wealth of science to be mined out of the TESS full frame images, and I think there is a potential for citizen science (and likely Planet Hunters) to play a role in utilizing these observations to their fullest. If you’re interested in learning more about the TESS spacecraft , camera design, and mission goals you can check out this paper by the TESS Team which is where I got the information for this post. Recently NASA selected the next set of missions for the Explorer Program to be launched in 2017 from four proposed mission concepts. The two winning missions were the Transiting Exoplanet Survey Satellite (TESS) and Neutron Star Interior Composition Explorer (NICER). In some ways you can think of TESS as Kepler’s successor but while it will be monitoring stars for the drop in light due to transiting exoplanets like Kepler, it’s mission is slightly different. Unlike Kepler which stares continuously at 1 field for it’s entire mission, during TESS’s 2 year primary mission, it will stare at a patch of sky for a short period of time and then move on to examine new stars. In total TESS will survey ~45,000 square degrees of sky, ~400 times larger than the region Kepler monitors. TESS will target the brightest stars (G-K and M stars) in the sky, much brighter (and therefore closer to the Earth) than the Kepler field stars. TESS will therefore probe the frequency and properties of planetary systems that are in the solar neighborhood, and provide a catalog of the closest planet-hosting stars to be followed-up for many years to come. One of the exciting things about TESS is that the vast majority of the stars it monitors will be prime candidates for current ground-based radial velocity instruments like HIRES (which has been used to help study Planet Hunters planet candidates), HARPS-N, and HARPS-S. This means for the vast majority of TESS planet candidates, we should be able to get masses or constraints on their masses. This is really important because the transit technique gets you a measure of the radius of the planet (if you know the radius of the star). If you can get the mass from radial velocity measurements, then you’ve got yourself the bulk density of the planet. You can think of bulk density as a proxy for composition, and so there will be a large sample of planets to examine how their size and composition compare to that of the planets in our Solar System. In addition, TESS planet host stars will be prime target for studies with the in-construction James Webb Space Telescope (JWST, a space-based infrared telescope scheduled for launch in 2018), that will enable study of the chemical composition of the atmospheres of many of TESS-discovered planets. Just like Kepler, I think TESS will open a new era in the search and characterization of exoplanets. I think there is a place for Planet Hunters in the TESS age, and I hope that in the future we’ll be able to share TESS light curves on the Planet Hunters website. You can learn more about TESS here.